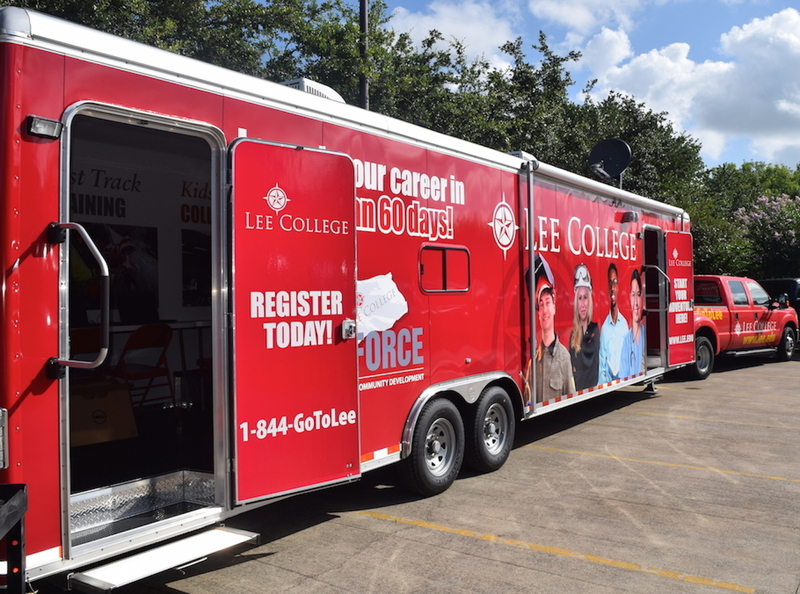 The doors of the Lee College Mobile Go Center will be open to prospective students Aug. 5-6 as part of the Tax-Free Weekend Event at San Jacinto Mall in Baytown. The center is equipped with high-speed Internet, satellite dishes, laptops and other equipment and resources needed to help prospective students explore Lee College program offerings and even register for classes on the spot. BAYTOWN, TX — Shoppers hunting this weekend for sales tax-free deals at San Jacinto Mall will also have the chance to start their pursuit of higher education at the Lee College Mobile Go Center, a 42-foot trailer equipped with state-of-the-art technology and everything a prospective student needs to explore program offerings and even register for classes. The Mobile Go Center will be stationed at the mall, located at 16900 Garth Road in Baytown, from 10 a.m.-2 p.m., Friday and Saturday, Aug. 5-6. Visitors are welcome to climb aboard to learn more about the degrees and certificates available at Lee College, financial aid and scholarship options, and the application and enrollment process. There will also be prizes giveaways and additional information about the college’s various community outreach efforts. Lee College acquired the Mobile Go Center in 2015 with a $165,000 grant from the Texas Pioneer Foundation. The center is outfitted with high-speed Internet, satellite dishes, remote printers, laptops and LCD televisions. For more information about the center or the Tax-Free Weekend Event at San Jacinto Mall, contact Keon Baldwin of the Office of Outreach Services at 281.425.6340 or kbaldwin@lee.edu.